A fifth-round pick by the Jaguars in 2015, the Florida Times-Union writes that wide receiver Rashad Greene will have much at stake in his third training camp. 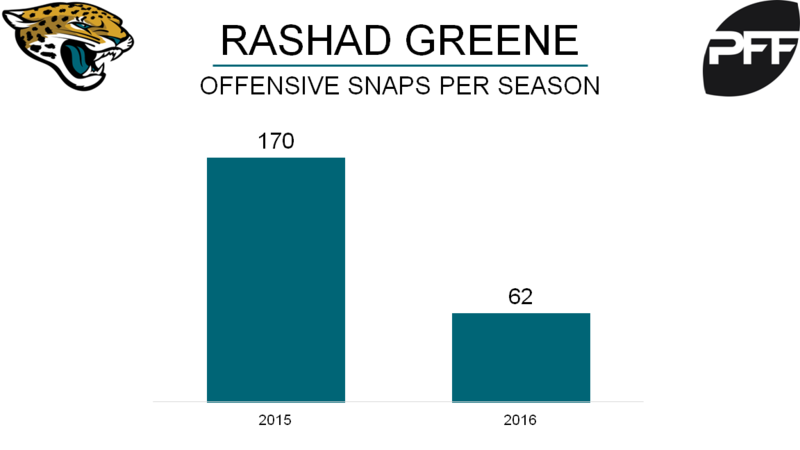 Due to thumb surgery that put him on short term injured reserve in 2015 and an Achilles injury which prematurely ended his 2016 season, Greene has only played in 13 of 32 possible games. In that span Greene was on the field for 232 offensive snaps. Greene’s 2016 overall grade of 57.4 would have been 95th out of 116 wide receivers, had he qualified. The Times-Union also mentioned that Greene’s best bet to make the Jaguars roster would be as their primary punt returner. That is an area Greene has experience in during his NFL tenure. For his career, Green has returned 39 punts for 432 yards and a touchdown for an average of 11.1 yards per return.